Since the 1990, the residents of the neighborhood of Cidade dos Meninos, in Duque de Caxias/RJ, struggle for remediation of chemical contamination that threatens their health and for their permanence in the site. They demand remediation of contamination in order to continue to live safely in that neighborhood. Despite the contamination, in fact, it is considered better than other localities of the municipality, marked by urban violence, and a lack of infrastructure and public services. The location known today as the Cidade dos Meninos has its origin in the creation of a boarding school for poor girls in 1946 in the area of the former farm São Bento. The institution was created by first lady Darcy Vargas, wife of Getúlio Vargas who was President of Brazil twice (1930-1945, initially as revolutionary leader and later as a dictator and between 1951 and 1954, as democratically elected President through elections). From 1949, the Ministerio da Educacao e Saude (today the Brazil has two separate ministries for matters of health and education) installed the Instituto de Malariologia, on the same grounds of the boarding school, which later created there the Prophylactic Products factory, dedicated to the production of hexachlorocyclohexane (HCH), copper arsenite, hexachlorobenzene (BHC), monofluoroaetato sodium, calcium cyanide and diclorodifenil trichlorethane (DDT) among other chemical compounds used at the time to combat the mosquito of the genus Anopheles vector of Protozoan that causes the malaria. In 1961, the factory was moved to the Fundacao Oswaldo Cruz (FIOCRUZ) in Rio de Janeiro. However, after the closure of the factory, an appropriate disposition of toxic waste has not been carried out. Drums and lots of pesticides were abandoned without any type of treatment or guidance to the local population about the danger of those substances. During the following decades, the students and staff of the boarding school, both residing in the land next to the old pesticide factory, remained in the area and exposed to chemical contamination. They knew about the insecticides abandoned there but have not been informed of the health risks. These people continued to use the material on a daily basis to combat mosquitoes, cockroaches and other pests. Many of them took the substance out of the neighborhood, which was sold in fairs. In 1989, the site was the subject of supervision of the State Foundation of Environmental Engineering (FFEMA), when it was noted the inadequacy of how the compounds had been stored and used during the three decades before. On occasion, 40 tons of material, mainly hexachlorocyclohexane (HCH) was still deposited on site. Subsequent studies have estimated the initial amount between 200 and 400 tons. Since then, several studies have been conducted to identify the extent of environmental contamination and damage on human health and risk to ecosystems. At the same time, residents, most employees or former employees of the boarding school and their families and the inmates, went on to claim the remediation of environmental contamination and the necessary medical care. In 1993, the Juvenile Court of Judicial District of Duque de Caxias ordered the closure of the boarding school and the transfer of students to their counties of origin. The residents, however, remained in place. Studies conducted by FIOCRUZ at that time identified that at least 24% of the local population had HCH levels in their blood above of safe limits. In 1995, the Ministerio da Saude hired a private company to remedy the main focus of contamination. However, the use of carbohydrate (cal) to neutralize the HCH proved inefficient, resulting in the formation of new compounds also toxic. Subsequent studies have identified that the new compounds increased migration of contamination and its ability to penetrate into the soil, contaminating the water table. Since then, the Federal Government went on to defend the transfer of the local residents and the ground isolation. This alternative received opposition from residents, because despite the chemical contamination, the city of the boys is one of the few areas of the city where the original vegetation remains relatively preserved, in contrast to the intense urbanization and violence the rest of Duque de Caxias. 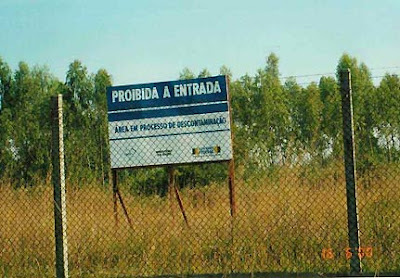 In addition to negotiating with the villagers, the Federal Government sent part of the compound to be incinerated at the Refinaria de Duque de Caxias (REDUC). Currently, some of the residents of the Cidade dos Meninos has already been removed from the site and others are resisting the displacement, while claiming that the State should restore the area. However, removal continues to be the only answer offered both by the Governo Federal, and the municipality of Duque de Caxias. During the Rio 20, the site was visited by a caravan of journalists, researchers and environmental activists who participated in the event known as Rio Toxic, which visited also other outbreaks of contamination of the State, such as Sepetiba Bay. This expanded disclosure of the case, but have not yet resulted in benefits for the residents who remain in place. Project Details Between 200 and 400 tons of pesticides were abandoned in this place. Development of Alternatives Restoration of the area and no forced displacement which will surely worsen peoples living conditions. Why? Explain briefly. Some of the material is contaminating the region and local residents are still fighting for not being displaced. CAMARA DOS DEPUTADOS. Consulta Tramitacao das Proposicoes: Proposicao: PL-3034/2004. Disponivel em: Acesso em: 29 set. 2009. OLIVEIRA, Rosalia M. et al. Contaminacao por hexaclorociclohexanos em area urbana da regiao Sudeste do Brasil. Rev. Saude Publica, Sao Paulo, v. 29, n. 3, Jun. 1995. Disponivel em: Acesso em: 29 set. 2009. doi: 10.1590/S0034-89101995000300011. HERCULANO, Selene. A Cidade dos Meninos e o caso de contaminacao por HCH (hexaclorociclohexano). In: ACSELRAD, Henri, HERCULANO, Selene e PADUA, Jose Augusto. (Orgs.). Justica Ambiental e Cidadania. 2.ed. Rio de Janeiro: Relume Dumara: Fundacao Ford, 2004. pp. 291-302. ISBN 85-7316-353-4. ANDRADE, Hanrrikson. A margem da Rio 20, Cidade dos Meninos tem mais de 90% de moradores contaminados por pesticida. UOL, 17 jun. 2012. Disponivel em: Acesso em: 31 mai. 2013. JUNIA, Raquel. O outro lado da cidade modelo. EPSJV/ Fiocruz, 17 jun. 2012. Disponivel em: Acesso em: 31 mai. 2013.